Errol: Dr. Mary Crowell is an insanely talented musician. Her skill on the piano far surpasses my skill like a Korean’s skill in Starcraft far surpasses a dead sloth. Her most simplest song I have the most difficult time playing, and that’s Legolas. Debs does a wonderful job on it, of course, but when we were playing, I was trying my best to play as soft as possible so that no one would notice me butchering the song. 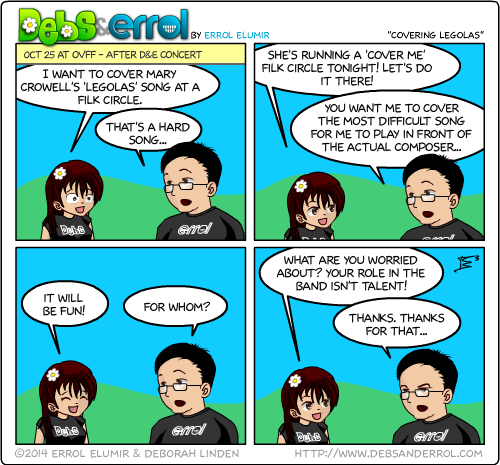 So, is this the last comic before your hiatus then Errol? Tomorrow is the last comic!